About Maus - Spots and stripes and bars! Oh, Mau! 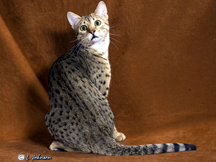 Introducing the world's only naturally spotted breed of domestic cat. Don't be fooled by those other hybrid, domestic, spotted, wild-looking, and exotic cats. The Mau is a natural! Thousands of years of history, spots, stripes and a great personality contribute to the unique charm of this cat. 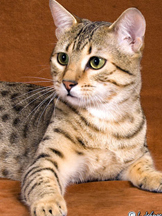 Join the ancient Pharaohs of Egypt and enjoy an Egyptian Mau! 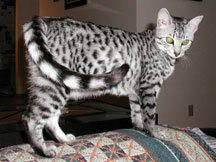 As if being naturally spotted is not enough, the Egyptian Mau is also one of the oldest domestic breeds of cat. "Mau" is the Egyptian word for cat. Pederson claims that, based on examination of mummified Egyptian cats, the ancestor to the Mau probably was as subspecies of African Wild Cat brought to Egypt from Ethiopia. Mummification is only one of the indicators that cats were important to ancient Egyptians. As early as 1500 BC, cats are associated with Egyptian goddesses, mentioned in writings, and illustrated in tomb paintings. One painting shows a spotted cat, resembling a Mau, retrieving birds for an Egyptian hunter. Prior to World War II, Egyptian Maus and other pedigree cats were bred and shown in Europe. The war disrupted the breeding programs and scattered many cats. Nathalie Troubetskoy, and exiled Russian Princess, received an Egyptian Mau kitten as a present. She fell in love with the breed and, during the 1950's, she brought a few related Egyptian Maus to the United States, started a cattery, and worked to preserve the breed. The Cat Fancier's Association formally recognized the breed in 1977. The breed was preserved, but not genetically healthy because of years of inbreeding and close breeding. Because of hereditary health problems, select cats from India and Egypt have been imported to add new genes to the Mau population and reduce health problems. The random spots may be any size and shape and should contrast with the cat's ground color to clearly show. If the spots form a pattern, the pattern should follow horizontal lines down the cat's body rather than vertical stripes around the body. The spots gradually change to stripes around the shoulders and haunches and the legs are barred. Spots on the Mau's stomach look like vest buttons. The neck is marked with one or more broken necklaces and the cheeks of the face are marked with two mascara lines. The forehead bears the characteristic tabby "M" marking. Dark lines run between the ears and change to elongated spots along the back. The tail is striped with a dark tip. Silver, bronze, and smoke Maus may be shown in competition. 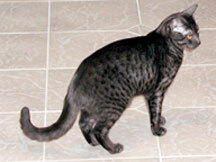 Regardless of the color, the contrast between with the cat's ground color and markings must show its pattern clearly. Silver Maus have a pale silver ground color with charcoal markings, a brick red nose and black paw pads. Bronze Maus have a warm bronze ground color with dark brown-black markings, a brick red nose and dark brown or black paw pads. Smoke Maus have a pale silver ground color with all the hairs tipped with black, a silver to white undercoat, charcoal markings, a black nose and whiskers, and black paw pads. The Mau is an active, alert, medium size, muscular cat. Its head is a slightly rounded wedge shape with a profile that shows a gentle concave contour from the bridge of the nose to the forehead. The Mau has a firm chin. When seen from the front, the nose is equally wide along its entire length. Maus have light green eyes, however, an amber tint is acceptable in young cats. They have large, almond shaped eyes that slant up toward the ears. Mau ears are medium to large and broad at the base. Mau legs and feet are proportional to its body, with the hind legs being slightly longer than the front legs. The feet are slightly oval and dainty. 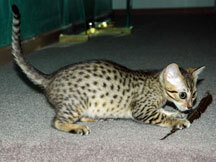 Characteristic of fast running cats, the Mau has a loose flap of skin that runs from its flank to its hind knee. Maus can run up to 30 mph; just try to catch one that doesn't want to be caught! Their tail is medium long and tapered. It has a medium length coat, which requires minimal special grooming. With big eyes and a little frown the Mau often appears as a worried cat. Like people, each cat's personality will be a unique combination of genetics and environment. Maus are alert, active, intelligent, and sociable animals. They seem to always know what is going on! They love to play and seem to simulate hunting as they stalk and pounce on their favorite toy (or your toe). Egyptian hunters may have used Maus to retrieve birds, and some Maus enjoy playing fetch with their favorite toy or even a balled-up piece of paper. They will return it almost as fast as you can throw it. They are fast runners and good jumpers. Maus, like many breeds of cat, are intelligent and easily learn simple tricks such as sit, shake, and beg. They quickly learn where their toys and treats are kept and will work to try to open doors and drawers to get them. Maus get along with family members, children, and other pets and often form a special bond with a particular family member. While they are not extremely vocal, a Mau will meow to let you know it needs food, water, or a clean litter box. They growl while playing and chatter at the sight of birds. Because the Mau is a pedigree cat, it should be kept indoors.